Cincinnati 1810G ¼” x 10’ Power Shear s/n 48687 w/ Cincinnati Controls, Power Back Gaging, 10’10”Squaring Arm, (2) Front Material Supports. Cincinnati 135CBx8 135 Ton x 8’ Hydraulic Press Brake s/n 48686 w/ Manual Back Gage, 10’ Bed Length,8”Stroke, 7 ¼” Throat Depth, 102 ½” Between Uprights. DiAcro 35 Ton x 6’ Press Brake w/ Manual Back Gage, 6’ Bed Length, 9 ¼” Throat Depth, 62” Between Uprights. DiAcro 14-48- 2 17 Ton x 48” Hydra Power Press Brake s/n 6821179575 w/ Manual Back gage, 48” Bed Length, 6 ½” Throat Depth, 36” Between Uprights. DiAcro 14-48- 2 17 Ton x 48” Hydra Power Press Brake s/n JD1215 w/ Manual Back gage, 48” Bed Length, 6 ½” Throat Depth, 36” Between Uprights. Piranha mdl. P50 50 Ton Iron Worker s/n P50-8614 w/ 50 Ton Punch Cap 1 1/16” thru ½”, 13/16” thru ¾”, Flat Shear 1” x 4”, ¾” x 10”, 5/8” x 15”, Angle Shear 5” x 5” x 3/8”, Rod Shear 1 ½” Round, 1” Square Bar, Coper/Notcher 2 ¾” x 4” x ¼”. Euromac “Multi 220/6M” 9” x 9” Power Notcher / Corner Rounding Notcher s/n M6600996 w/ Multi-Radius Punch Head, Fence System. Amada CS-220 8 5/8” x 8 5/8” Power Notcher s/n 543651 w/ Fence System. 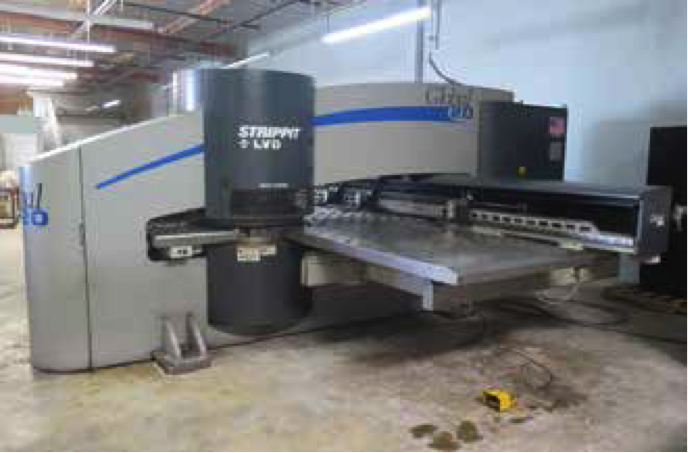 Strippit Single Station Punch Press w/ (2) Die Holders, Thin Station Tooling, 17 ½” Throat.PemSerter Series 4 6-Ton x 18” Hardware Insertion Press s/n F4-1153 w/ Tooling.Hendley & Whittemore 16GA x 48” Hand Roll s/n 11658 w/ 3” Rolls, Table. Gerver 23 ¾” Hand Shear w/ Back Gage, Table. Bridgeport /Romi mdl. 13-5 13” x 45” Geared Head Lathe s/n 34533 w/ 50-2500 RPM, Taper Attachment, Inch/mm Threading, Tailstock, Steady Rest, Indexing Tool Post, 5C Speed Chuck, 8” 4-Jaw Chuck, 6” 3-Jaw Chuck, Coolant. Bridgeport Vertical Mill s/n 267903 w/ Acu-Rite Millmate DRO, 2Hp Motor, 60-4200 Dial Change RPM,Chrome Ways, Power Feed, 9” x 48” Table. Bridgeport Vertical Mill s/n 65566 w/ 1Hp Motor, 80-2720 RPM, 8-Speeds, 9” x 32” Table. 2013 Timesavers Lynx mdl. LYNX37MWT-DB- 60 Dual Head (Belt and Brush) Wet Belt Grainer s/n SN32322 w/ Timesavers Controls, 36” Belt Feed, Belt and Brush Heads, Air Knife, Coolant System. MAX 6” Stroke Sander w/ 24” x 48” Sliding Table.Falls Products mdl. 131 “D-Bur- R” Edge Deburring Machine s/n 2870. Boyar Schultz mdl. 612 6” x 12” Surface Grinder s/n 10385 w/ Fine-Line Electromagnetic Chuck. (2) Mr. Deburr Media Tumblers. Dry Blast Cabinet w/ Dust Collector. Baldor and Craftsman 6” Bench Grinders. Powermatic 6” Belt / 12” Disc Sander. Lincoln Idealarc TIG-300/300 AC/DC Arc Welding Power Source s/n AC477481. Miller Syncrowave 250 CC-AC/DC Arc Welding Power Source s/n KF899409 w/ Miller Watermate 1A Cooling System. Lincoln 180 Dual Power-MIG MIG Welding Power Source s/n M3170103397. Stryco Type D-1840 40kVA x 18” Spot Welder s/n 18237. Wilton mdl. 7020M 11” Horizontal Miter Band Saw s/n 105145 w/Manual Clamping, Work Stop. Wells mdl. 58B 7” Horizontal Band Saw s/n 2150 w/ Vertical Attachment. Skilsaw Table Saw w/ Stand. (2) Delta mdl. 15-660 Pedestal Drill Presses. Press Brake Dies w/ Racks. Strippit Punch Die Tooling w/ Storage Cabinets. 1995 GMC W4/GAS Forward 12’ Box Truck Lisc # 8C19724 w/ V8 EFI Gas Engine, Automatic Trans, AC, AM/FM/Cass, 223,638 Miles, VIN# 4KDB4B1A6SJ000741. Toyota 42-5FG15 2600 Lb Cap LPG Forklifts/n 76865 w/3-Stage Mast, 185” Lift Height, Side Shift, Pneumatic Yard Tires, 3034 Metered Hours.